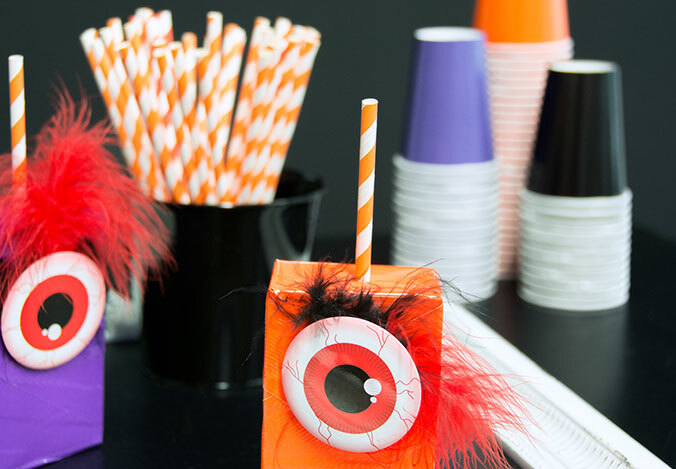 It’s time for another blog on Halloween decorating and party ideas – but we think this one will stick with you for a while. 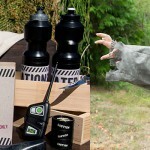 We decided to try our hand at some Duck Tape® DIY ideas for Halloween, and we had a lot of fun with it! The Duck Tape® brand makes tons of different crazy colors and patterns of the famous tape we all know and love – check their website for the full selection. As it turns out, Duck Tape® can be used for just about anything. 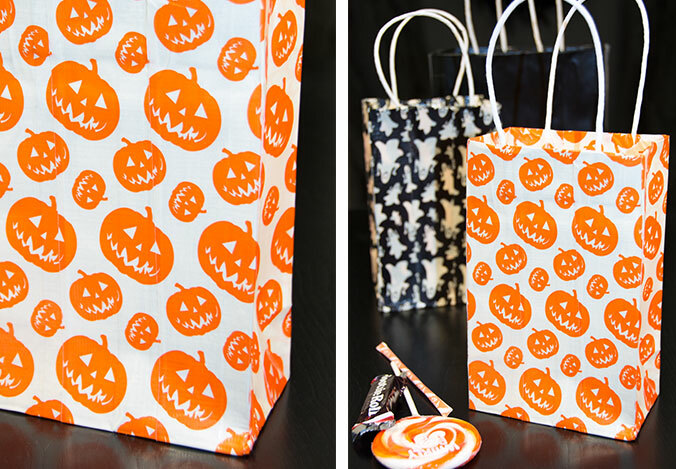 For example, ordinary paper treat bags can be pretty boring for trick or treating. If you and your kids are going to get all dressed up as your favorite characters for Halloween, bring a little character to the bags, too! To create your own Duck Tape® treat bags, create some sheets of “tape fabric” by laying strips of tape on top of each other, sticky side to sticky side. Once it’s large enough, you can cut and fold it into a bag shape and secure with more strips of tape. Click here to get the full set of how-tos from Duck Tape®’s Ducktivities® page. 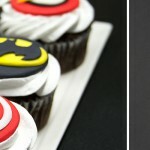 Alternately, you can simply decorate existing paper or cloth bags with pieces of Duck Tape® for a fun and unique look. For ours, we used a couple of Duck Tape®’s awesome Halloween patterns – glow in the dark skulls, and glow in the dark pumpkins. Mix and match with solid colors, or stick to your child’s favorite. Using glow in the dark Duck Tape® can also increase the visibility of child’s Halloween costume, if your community trick or treats at night. Candy is dandy but safety comes first! To make the bow itself, create two small strips of Duck Tape® fabric roughly 6 inches long, and the width of one strip of tape. With a pair of scissors or a craft knife, taper each corner of each strip into an oval shape. Each one will be loosely folded over onto itself as shown. Wrap a half-width strip of Duck Tape® around the pieces of the bow and the headband to stick everything together. This craft was inspired from Duck Tape®’s Top Hat Headband, which you can view here. Cut a circle out of some cardstock or posterboard a few inches in diameter and cover in black Duck Tape® – this will be the brim of the hat. Make another circle in the same way, but make this circle about twice the size of the first. Cut a straight line into it, from the edge to the center, and fold it into a cone shape, holding it with Duck Tape®. Use small strips of black Duck Tape® to stick the cone to the brim, and create a stripe with orange Duck Tape® around the base. Use more black tape to affix the witch hat to the headband. Nothing says Halloween like an orange and black Halloween cat! 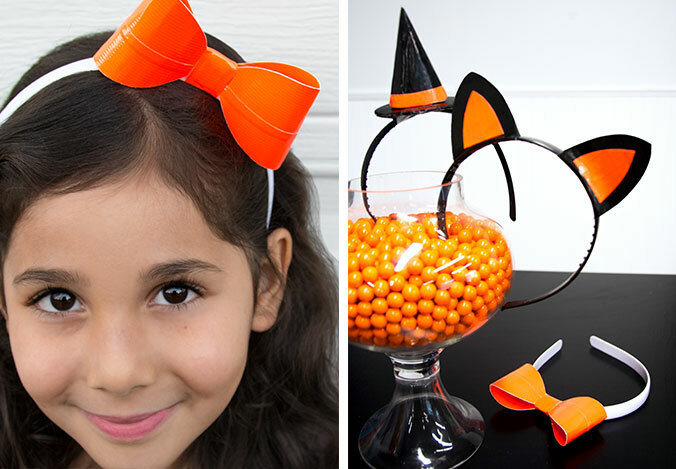 Use these cat ears to turn any black outfit into a quick cat costume. Cut a couple triangular wedge shapes from a small piece of black Duck Tape® fabric. Optionally, you can sandwich some pieces of floral between the tape layers to create posable cat ears. Use black Duck Tape® to affix each ear firmly to the headband. Finish with smaller, similar shapes of orange Duck Tape® to make the insides of the ears. Halloween parties can be done with Duck Tape®, too! 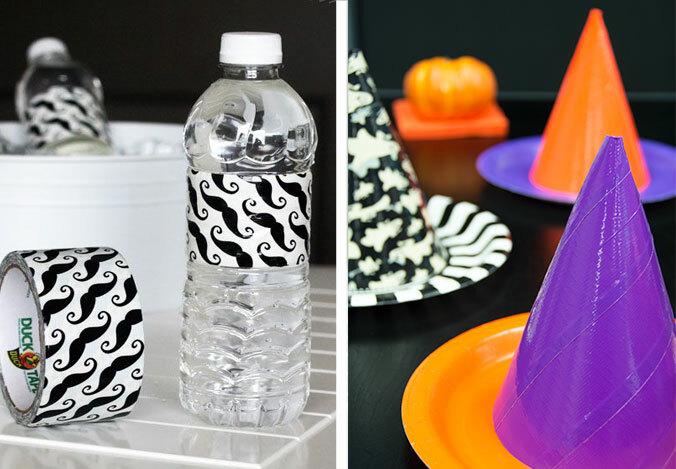 We wouldn’t suggest making plates or cups out of tape (that might get a little messy, and there are plenty of Halloween party supplies for that, anyway), but black Duck Tape® bottle wraps add some Halloween flair in a flash. 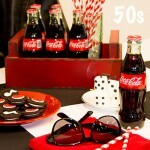 Guests can even write their own names or messages on the bottles with a silver or white marker. 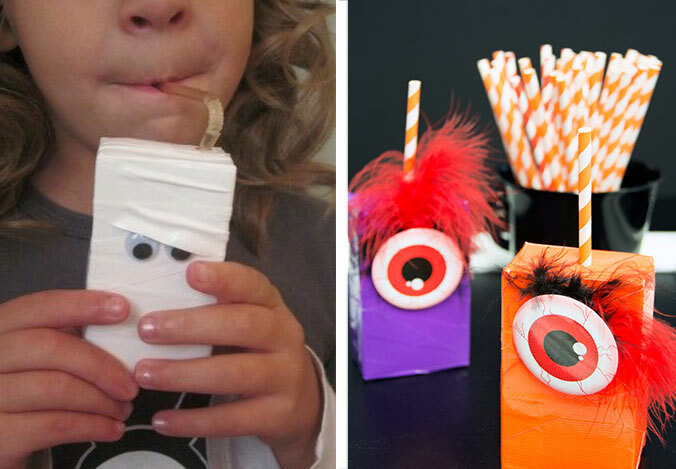 Use Duck Tape® to dress drink boxes into spooky monsters that match your Halloween party color scheme. We used purple and orange tape, with some colored craft feathers and some printable eyeballs for these guys. With some white tape, we were able to make one into an easy mummy, too! Strips of varying widths were used for the mummy wrappings, and a couple of cute googly eyes were inserted for fun. Covering paper cone party hats in colored Duck Tape® is a fun way to make each table setting at the Halloween party a little more inviting. Go solid like we did, or mix it up to match your theme. 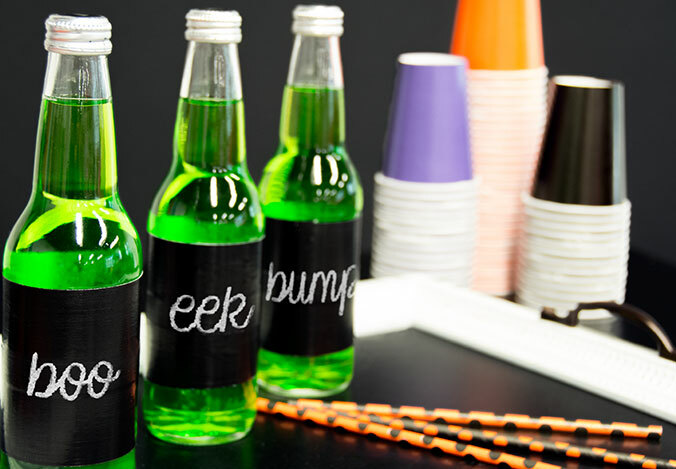 This Duck Tape® Halloween hostess gift comes from Jen Dixon at Craft That Party. Click here to visit her blog and learn more! For more Halloween decoration inspiration using Duck Tape®, visit Duck Tape®’s Ducktivities® page as well as their Pinterest boards! 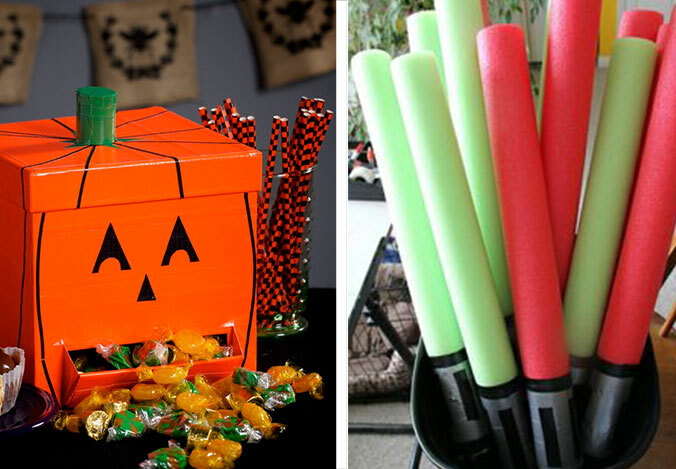 There’s a ton of Halloween crafts you can try yourself – this amazing Duck Tape® jack o lantern and these Duck Tape® Lightsabers (featuring foam pool noodles) are just two of them. 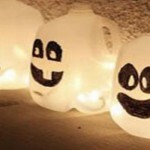 What did you think of our Duck Tape® Halloween ideas? Have you ever crafted with Duck Tape® before? What kind of Halloween costume ideas and party ideas should we come up with next? 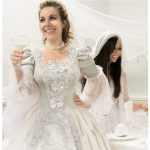 Follow us on Facebook and Twitter @BuyCostumes to share your thoughts! Check out our Pinterest page for our curated collections of costume ideas, too.